MISAMIS Oriental’s legislature yesterday recognized former Cagayan de Oro councilor President Elipe as its new member after a nearly 40-minute debate involving Vice Gov. Jose Mari Pelaez, provincial board member Gerardo Sabal, and Elipe himself. Officially, there was no provincial board member that objected to the motion of Sabal to recognize Elipe as the replacement of a dead man, the late provincial board member Mario Emano who passed away late last year. Elipe attended the session of the provincial board, armed with a photocopy of his appointment papers which he said was signed by President Duterte. Two provincial board members — Wayne Militante and Mercy Acain — seconded Sabal’s motion. Officially, no one raised an objection, hence, there was no need to divide the house. But Vice Gov. 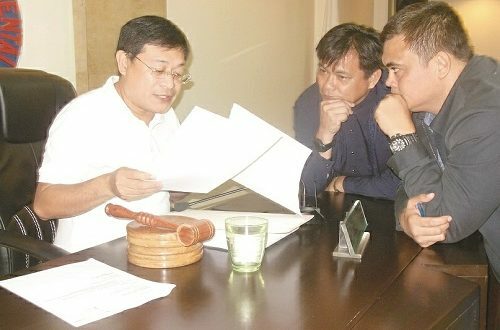 Pelaez found himself arguing with Sabal and the then still-to-beecognized provincial board member Elipe about the proposal to recognize Gov. Emano’s brother-in-law. “Wala nako magawa d’yan,” said Pelaez as he banged the gavel and told the provincial board members to clap their hands. Not one of them clapped except for some people in the gallery. Pelaez earlier questioned why the officials came for a provincial board session when it has been their “tradition” not to hold one while the budget hearings are ongoing. He said there was also no clear item in their agenda. To solve the problem, right there and then, the provincial board members agreed on agenda items like a proposed resolution to recognize Villanueva’s police chief who was given an Metrobank Foundation award for being an outstanding officer, and to request for free jackets from the Misamis Oriental Integrated Sports Complex which Elipe managed before he was appointed. Another was the proposal to recognize Elipe as member. Pelaez said he was reluctant to quickly recognize Elipe because his papers were not yet in order as of yesterday. He said there was no official instruction from the interior department and all that Elipe had was a photocopy of his appointment. Pelaez said the widow of the late provincial board member Roldan Lagbas was recognized by the provincial board only after she presented an original copy of her appointment and with guidelines from the interior department. There were other similar cases, he said. Elipe said he attended and participated in yesterday’s session because he did not want to be accused of dereliction of duty. He said any directive from the Department of Interior and Local Government would just be ministerial because his appointment papers came from President Duterte himself.